Only four months (November 16, 2006) after Nikon introduced �The most compact and lightweight Nikon digital SLR ever, combining outstanding picture quality with a design that�s easy for everyone�, Nikon introduces the eXtended version of the camera. 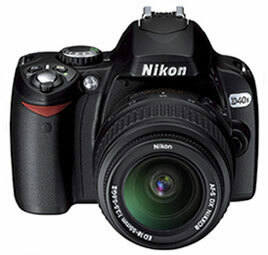 The D40x is a 10.2 mpix version instead of the 6.0 mpixes of the D40. It also increased the speed from 2.5 to 3.0 frames per second. I guess this comes from the faster channels of the 10mpix chip. Further we have ISO starting from 100. It’s a bit of a surprise this camera was announced as everyone is expecting a D3h or D3x. It’s also strange that it is announced so quickly after the initial version so I wonder if the 6mpix version will be discontinued due to lack of sensors. According to the announcement this is a sister camera to the D40 so it might be a new way of Nikon’s branding like they do with the professional camera’s D2h, D2x. Yes this is another very good fancy from Nikon for some people. With 55-200mm lens is very good sale contra Canon 400D.